Modified anterior tension wiring with K-wires and cannulated lag screws with anterior tension wiring are currently the fixation of choice for patellar fractures. Failure of fixation, migration of the wires, postoperative pain and resulting revision surgery, however, are not uncommon. After preliminary biomechanical testing of a new fixed-angle plate system especially designed for fixation of patella fractures the aim of this study was to evaluate the surgical and anatomical feasibility of implanting such a plate-device at the human patella. In six fresh unfixed female cadavers without history of previous fractures around the knee (average age 88.8 years) a bilateral fixed-angle plate fixation of the patella was carried out after previous placement of a transverse central osteotomy. Operative time, intra-operative problems, degree of retropatellar arthritis (following Outerbridge), quality of reduction and existence of any intraarticular screw placement have been raised. In addition, lateral and anteroposterior radiographs of all specimens were made. Due to the high average age of 88.8 years no patella showed an unimpaired retropatellar articular surface and all were severely osteoporotic, which made a secure fixation of the reduction forceps during surgery difficult. The operation time averaged 49 minutes (range: 36-65). Although in postoperative X-rays the fracture gap between the fragments was still visible, the analysis of the retropatellar surface showed no residual articular step or dehiscence > 0.5 mm. Also in a total of 24 inserted screws not one intraarticular malposition was found. No intraoperative complications were noticed. 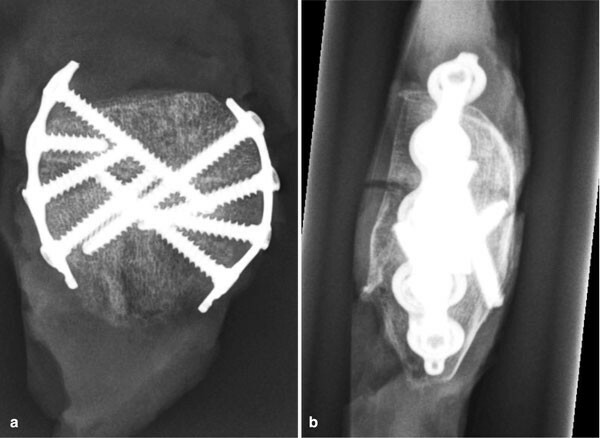 Osteosynthesis of a medial third patella fracture with a bilateral fixed-angle plate-device is surgically and anatomically feasible without difficulties. Further studies have to depict whether the bilateral fixed-angle plate-osteosynthesis of the patella displays advantages over the established operative procedures. The patella is the largest sesamoid bone in the body and its subcutaneous location makes it susceptible to direct injury . Only 1 % of all injuries to the human skeleton are patella fractures. Of those, only approximately one-third requires surgical attention [2, 3]. The aim of surgical treatment in addition to the preservation of most of the kneecap, is anatomical reduction of the articular surface, followed by stable fixation, restoration of the extensor mechanism and early mobilization [4–11]. Currently, the use of modified anterior tension wire with or without circumferential wiring is the standard surgical treatment of patellar fractures [6, 12–14, 3, 10]. Despite several technical modifications of the anterior tension wiring, early fracture dislocation can be observed in 22-30% of all cases [15, 16]. Apart from failure of fixation, migration of the wires, postoperative pain and resulting revision surgery are not uncommon, making the long-term outcome in clinical studies quite poor [4, 17, 5, 7, 9, 18]. Secondary postoperative pain due to skin irritation caused by the K-wires also is a common problem in the tension-band wiring of patellar fractures [14, 4, 5, 9, 19, 18]. Thus, revision surgery with K-wire removal becomes necessary in up to 65% of cases [2, 4, 5, 9]. The development of fixed-angle plates, which are based on the concept of an internal fixator , has led to an improvement in the biomechanical stability of the plate-bone interface [20, 21]. Based on this improved stability, fixed-angle plate systems differ substantially in their biomechanical properties from conventional plates making their application possible even in skeletal segments that were previously denied of conventional plating. Furthermore it has been possible to develop even smaller and thinner fixed-angle plates. For use in transverse patella fractures a 2.7 mm bilateral, polyaxial, fixed-angle plate system (manufacturer: Königsee® Allendorf, Germany) has been designed. In a preliminary biomechanical testing until failure using a Sawbone® patella fracture model it could be demonstrated that a bilateral, fixed-angle plate osteosynthesis results in significantly superior strength and rigidity compared to modified anterior tension wiring or cannulated lag screws with anterior tension wiring . Since the biomechanical examination was conducted on polyurethane foam patellae, the objective of this study was to determine the technical and anatomical feasibility of reducing and fixing a horizontal patellar fracture with two 2.7 mm polyaxial locking plates which are attached to the medial and lateral rim of the patella. The operations were carried out in six fresh unfixed female cadavers of an average age of 88.8 years (range 80-96 years) provided by the Institute of anatomy of the Heinrich Heine University Düsseldorf. In order to ensure that none of the bones presented with pathological qualities, clinical and radiological examinations were conducted and patient histories were evaluated. Through a longitudinal incision of 10 cm of length above the patella, the dissection was executed down to the anterior surface of the patella so its medial and lateral margins were made visible. After identification of base and apex of the patella a transverse incision of the soft tissues in the middle part of the patella was conducted. The dissection was extended to the medial and lateral retinaculum, as usually in dislocated transverse patellar fractures it comes to a tear of the retinacula. Then, using a surgical saw a transverse osteotomy was placed in the middle of the patella just to the subchondral bone of the articular surface (Figure 1). The osteotomy were completed by dissection of the subchondral bone and articular cartilage with a chisel (Figure 2). Subsequently, the transverse patellar fracture was reduced under digital control of the articular surface which was made accessible via the cut through the retinacula. Temporary reduction was secured with a pointed reduction clamp, with one point placed at the base of the patella, the other at the apex. Transverse Osteotomy in the middle of the patella using a surgical saw. Completing the osteotomy through the subchondral bone and articular cartilage with a chisel. Then the specifically for the patella designed bilateral, fixed-angle plate system (Königsee Implants®, Allendorf, Germany) with four respectively five locking holes, according to the given anatomy of the patella, was applied. The titanium plates had a thickness of 2.7 mm with polyaxial angle-stable locking options for the osteosynthesis screws. Both locking plates were bent semicircularly, and placed each to the medial and lateral margin in an 80 degree angle to the anterior surface of the patella. These plates have an additional eyelet on each end allowing a mutual tensioning of the implants in the direction of the pull of the extensor mechanism in order to enable greater stability of the construct. Both in the proximal and distal eyelet of each plate a pointed reduction forceps was introduced and by closing of the forceps both plates were tensed longitudinally. Then, the most proximal hole of both locking plates was filled each with a 3.5 mm locking screw after placing the drill hole. This was followed by inserting 3.5 mm fixed-angle screws in the most distal plate holes. When using a 5-hole plate, 3.5 mm locking screws were inserted into all holes except the one at the fracture-site, so each plate was fixed to the patella with 4 angle-stable locking screws. At the 4-hole plates all holes were filled with 3.5 mm locking screws, as there was a greater distance between the two innermost plate holes, thus none of the screws were located at the level of the fracture. Afterwards the reduction forceps as well as the pointed forceps placed in the eyelets of the plates were removed (Figure 3). Finally, the entire patella with adherent quadriceps and patellar tendon was excised for further analysis and the skin was closed by suture (Figure 4). Positioning of the fixed angle plates after open reduction. Articular surface of a patella after open reduction and internal fixation with bilateral fixed-angle plates. In addition to the demographic data of the cadaver specimens, we recorded operative time, any intraoperative problems, the degree of retropatellar arthritis (following the Outerbridge-classification ), the quality of reduction by measurement of a remaining gap or step at the fracture site and the existence of any intraarticular screw placement. At last, lateral and a.p. radiographs of all specimens were made. Due to the high average age of the specimens of 88.8 years (range: 80-96 years), all samples showed an advanced degree of retropatellar arthritis with an average scale of 3.2 (range: 3-4) according to Outerbridge's classification . Not in a single specimen a regular retropatellar cartilage covering was found (Figure 4). The main problem during the performed plate fixation proved to be the partially very soft bone structure that made it difficult to securely position the reduction forceps and often led to a loss of reduction when drilling, requiring to repeat the reduction. In addition, there were sometimes collisions of the drill with already inserted screws on the opposite, since occasionally the direction of the drill hole was chosen to flat in order to avoid an intraarticular screw positioning, even though all patellae were thick enough to avoid collision of the screws with the drill. Anteroposterior conventional radiograph after open reduction and internal fixation using bilateral fixed-angle plates (four hole plate); b) Lateral conventional radiograph after open reduction and internal fixation using bilateral fixed-angle plates (four hole plate). Results after open reduction and bilateral fixed-angle plate fixation. The technique of tension wiring was first described by Pauwels 1966  and later popularized by 2 additional longitudinal parallel Kirschner wires as a modified AO tension band. [10, 7, 8] After numerous clinical and biomechanical studies currently a modified tension band wiring has been implemented as the most commonly used technique in almost all types of fractures. [7, 10, 14, 28, 6, 3, 2, 5, 18] Another frequently used alternative, which however can only be applied for simple central transverse fractures with good bone quality, is the cannulated lag screw osteosynthesis with anterior tension band wiring The combination of lag screws with a tension band promises thereby greater stability with fewer dislocations and higher loads to failure than any single method for themselves. [12, 14, 6] Both procedures are technically demanding and have high complication rates. In particular, the use of tension band wires often causes irritation of the soft tissues, so it has to be removed in 30-65% of cases in another surgery. [29, 4, 9, 19, 2, 15, 30, 5] Further frequently observed side effects are fractures and dislocations of the wire or wire components. [31, 29, 5] Catalano et al. reported that in patients with tension wires metal removal was necessary because of symptomatic wires in 65% of cases. Gosal et al. had a reoperation rate of 38% using stainless steel wires. Despite technical modifications of tension band wiring early fracture dislocation may take up to 22-30% in observed cases [15, 16]. A failure of fixation, the migration of wires, postoperative pain and revision surgery are not uncommon and some clinical studies have also shown that the outcome of the modified tension band in 25-42% of cases depicts only modest results [4, 17, 5, 7, 9, 18]. Hung  followed up 68 patients after tension band osteosynthesis, and only 72% were subjectively satisfied with the results, 37% had broken implants and 15% needed a revision surgery. Bostrom  reported in a sample of 422 patients of a 50-70% chance of long-term problems after surgical treatment of a patellar fracture, 37% having a degree of functional impairment, and 21% requiring revision surgery. In a different follow-up of 49 patellar fractures, a dislocation of the fragments over 2 mm could be detected in 22% of the fractures that were treated with a tension band wiring . In a preceding study conducted by our study group, the X-rays of 50 patients who were treated surgically using a modified tension band were analysed. A joint dislocation level of less than 2 mm became apparent in 50% of patients and a dislocation or step in the articular surface of > 2 mm appeared in 30% of patients . Although it is considered in the literature that a dislocation or step of the fracture gap of 2 mm does not affect the outcome after surgery of patellar fractures [2, 18] the anatomical reduction should be the objective of any surgical treatment of articular fractures in particular in the heavily loaded patellofemoral joint . Because most of the load passes over the patellofemoral joint, post-traumatic osteoarthritis after patellar fracture is often seen . sorensen  was able to demonstrate in a 10 to 30 year follow-up period more than 45 cases of patellofemoral osteoarthritis (70%) in 64 knees after patellar fracture, compared to 20 cases of patellofemoral osteoarthritis (31%) on the uninjured opposite side. Although the realistic assessment of joint injuries is difficult, many studies have shown that the best clinical results can be expected after the best possible reduction of the fracture [2, 4, 33, 5, 7, 9]. The goal of treatment is to restore the articular surface of the patella and to achieve a strong quadriceps-apparatus in order to allow for early mobilization of the knee joint [6, 35, 4, 5, 7–10]. The development of angle-stable plate systems with their excellent biomechanical properties brought about implants with a significantly reduced size but superior stability. This enhanced stability is the result of the better anchorage of the plate construct in the bone, which is based on the principle of internal fixation [20, 21]. The objective of developing a fixed-angle plate for the patella was providing an osteosynthesis with increased stability and lower deformation under load, compared to the currently most frequently used methods of modified tension band or cannulated lag screws with tension band and to prevent secondary loss of reduction. Also, the frequent problems of wires with irritation of the soft tissues and the subsequent removal of the material should be avoided. Due to the three-point loading of the patella with bending as well as tensile forces occurring at the fracture site and to prevent a deterioration of the skin by the implant, two plates were used, each of which being applied to the medial and lateral margin of the patella. As part of a previously performed biomechanical testing on polyurethane foam patellae (Sawbone®) it could be demonstrated that the application of two polyaxial fixed-angle plates, each of which being attached to the medial and lateral border of the patella, led to a stability twice as high (mean tensile strength: 2396 N) compared to the cannulated lag screws with tension band (mean tensile strength: 1015 N). Compared to modified tension band osteosynthesis with Kirschner wires (mean tensile strength: 625 N) a four-fold greater stability could be achieved . In addition to the significantly higher stability, the bilateral angle-stable patella-plate also shows significantly lower dehiscence of the fracture gap under tensile stress and a significantly higher modulus of elasticity (9.01 MPa), which surpasses the cannulated lag screws with tension band (4.98 MPa) and the modified tension band osteosynthesis with Kirschner wires (2.85 MPa) (p < 0,01). Thus, the fixed-angle plate is by far the most stable and most rigid construct with the lowest loss of reduction in comparison to the other two most commonly used methods of internal fixation of the patella . Attempts have already been made to fix patellar fractures with plates. "Basket plates" have been successfully used in clinical practice for fractures of the distal pole of the patella . However, these are not angle-stable and are suitable only for distal pole fractures of the patella. They are also much larger and are located directly at the patellar tendon, so irritation of the soft tissues could arise here. Because of their acting as an internal fixator, fixed-angle plates do not lie directly on the periosteum of the bone so the soft tissue underneath the plate is not damaged by pressure. Thereby the risk of a circulatory disorder of the patella, as it may be caused by cerclage-wires  or a direct injury to the quadriceps or patellar tendon through the implant can possibly be reduced. This feasibility study carried out on 6 fresh female cadaver knees showed that despite the osteoporotic bone of the very old body donors, the reduction of the patellar fracture was easily possible in the conventional technology, and the bilateral fixed-angle plate osteosynthesis could be accomplished not requiring too much time. Due to the thickness of the patella that exists even in these elderly patients  the risk of intraarticular screw placement under operational conditions is considered low and did not occur once in our series. Not a single patella stabilized with this technique had an articular step or dehiscence > 0.5 mm. The minimal dehiscences observed were a result of the defect in the bony substance after osteotomy of the patella. Despite the relatively small female patella it was possible to place a plate on the lateral and medial border of the patella without stripping the quadriceps tendon or patellar tendon. Due to the internal fixator principle the plate must not lie directly on the bone, so the soft tissue of the extensor mechanism can be spared. The plate system presented here is certainly not suitable for comminuted fractures of the patella, just for simple transverse patellar fractures, which make up the majority of patellar fractures with .34 % . Whether this change in principle, offers an advantage under clinical conditions compared to the established procedures - modified tension band or cannulated lag screw with tension band wire - must be shown in further clinical studies.